I am looking into the process of putting my T2 on Historic Registration, but won't actually be eligible until 2017, since my Australian compliance plate (located in the LHS door jam) is stamped as a 1987 model. Now, for anyone that needed a hint, it is actually impossible for it to be an '87 since they stopped building these things in 1986. Added to that, mine is definitely not even an 86 since it has the regular blue interior and digital speedo. I have also seen a similar anomaly on Harreh's car (now Haemesh's) which is plated as a 1986, but is definitely a pre 85 model given its interior and cluster appointment. So I am wondering two things; - Have any of you noticed the same with your T2's, and secondly, are there ANY other identifiers on the car which show the original build date as stamped from the factory? The original VIN is still visible on mine, with the Australian VIN riveted next to it, but I don't know if there is any original build date information stamped on the cars? Anthraxxx, could you maybe ask the question on the Facebook page for me? Happy if you just copy&paste the relevant bits of the above. Mine is actually called a 'HONDA DAVARO CITY' on the plate and manufactured by 'DAVARO PTY LTD'. No other plate that i'm aware of. Here in NZ they were also all over the place with the year on rego. The easiest way to tell what year it actually was, was to check the tags on the front seat belts (not rear as they were often replaced for compliance). Thanks for the input Hyperblade. I was starting to wonder whether I was the only one on here still ! 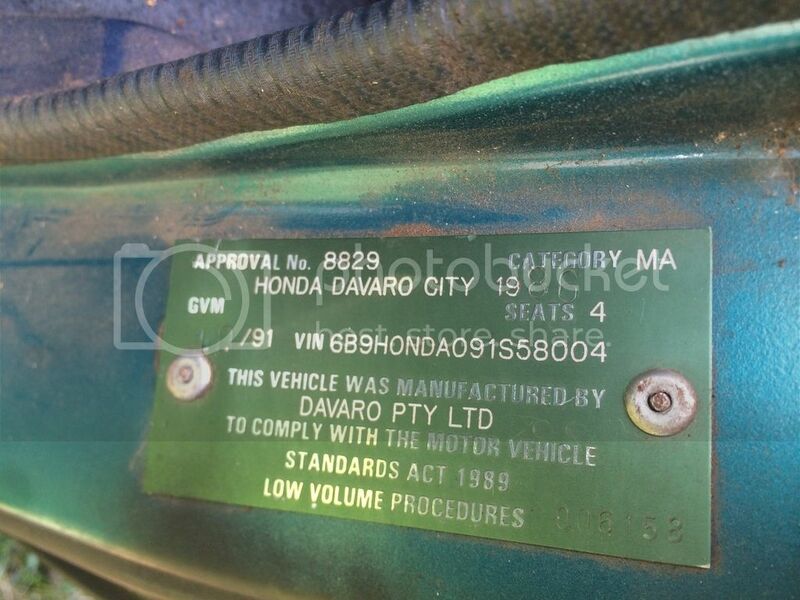 I have a naturally aspirated Honda City Cabrio, registered as a 1986 model, imported into NZ in 1990. However when I asked at the Honda dealer for parts and they looked up the body plate number, it comes up in their system as 1984. Maybe a dealer in Japan drove it around on dealer plates for 2 years as a demo ? who knows ? ... POINT (2) is "Davaro" an Indian assembled version ????? I know Suzuki did a deal and in India Suzuki Alto etc were assembled under licence and marketed as "Maruti". Perhaps something similar with Honda as with Suzuki ?